wonder woman of the week! 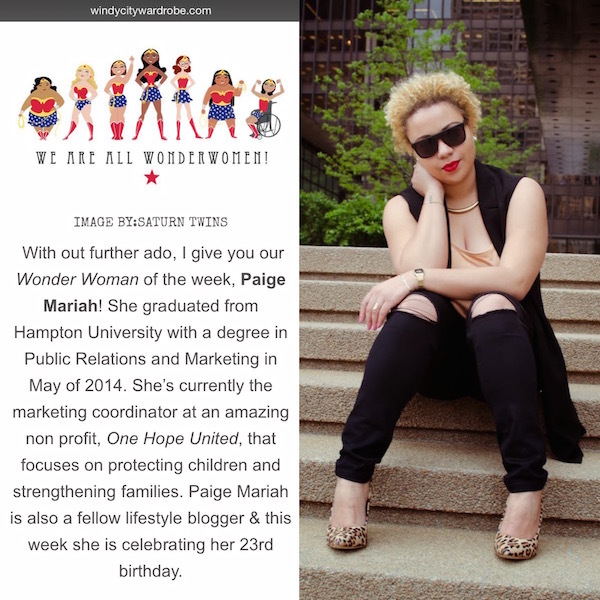 Thank you so much to Dasha of Windy City Wardrobe for choosing me to be last week's Wonder Woman of the week on her blog! I was super honored that she even reached out to me and I had a blast answering all of the interview questions. Though I feel like I have light years to go..being considered a Wonder Woman right now is amazing. Check out her awesome post and even learn a little bit more about me HERE. I'm so glad you enjoyed the experience! Hopefully, we will run into each other at one of the WCBC events.